To develop strength and power as a cyclist, try this exercise. Start in a lunge position with your right leg forward and the right knee over the ankle and the back knee just under the hips. Start by dropping the back knee towards the ground and then explosively lunging upwards, switching legs and landing with the left leg forward and the knee positioned right over the ankle. Continue for 30-60 seconds. If you require a more low-impact option, instead of jumping into your leg switch, just step and lunge alternating legs. Lie on your stomach. Position your elbows under your shoulders. Contract your abdominal muscles and then slowly lift your body onto your toes and your elbows. Keep your back straight and shoulder blades pulled together. Remember to breathe. Hold this position for 30-60 seconds. Curl backwards and move your feet outwards until you are lying comfortably over an exercise ball with your head, neck, shoulder and back comfortably supported and arched over the ball. Extend your arms out to the side. You should feel a great stretch in your chest, shoulders and back. This is a great stretch for cyclists. It places your body in a position that counteracts the strain on your back that you experience from cycling in a flexed position for an extended period of time. Hold this stretch for a minimum of 30 seconds. You can purchase a stability ball at your local department store like Target or Sports Authority. Remember to ride safely, defensively and always wear a helmet. Fortunately, Clark County is home to awesome paved trails that will keep you away from traffic including Salmon Creek Trail, Discovery Trail, Waterfront Trail, Padden Parkway and the trail from Vancouver Lake to Frenchman’s Bar. Get comfortable on these closed paths before you venture to the roadways and when you do hit the roads, wear bright clothing and try to cycle with someone or in a group to increase your visibility. 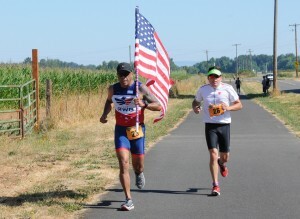 Join us for the RUN TO REMEMBER (May 28th 9am – Downtown Washougal, WA) Join us for this Memorial Day Mile and 5k/10k running and walking event on Memorial Day weekend that will benefit Battle Buddies, an organization that provides Service Dogs for our Veterans. Let us honor the brave men and women who have or are currently serving in our Armed Forces and remember those who have given the ultimate sacrifice fighting for our freedom.